The Verdict: Chase Sapphire Preferred® Card is one of the best rewards credit cards on the market. With Sapphire Preferred, the average person would earn roughly $1,475 in net rewards value over the course of two year’s use. And that’s with the card’s $95 annual fee factored in, too (Chase is a WalletHub partner). The core of this offer is a $600 to $750 initial rewards bonus, which can cover the cost of the card’s membership fees for over six years. Sapphire Preferred continues to pay for itself by providing two points per dollar spent on travel and dining as well as one point per dollar spent on everything else. When redeemed for cash back, these points are worth a penny each but jump to 1.25 cents each when redeemed for travel through Chase Ultimate Rewards. Lucrative Initial Rewards Bonus: Spending at least $4,000 during the first three months your account is open scores you 60,000 bonus points, redeemable for $750 in travel booked through Chase Ultimate Rewards or $600 cash back. If you’re going to spend that much anyway, that’s a pretty sweet deal, especially given Chase’s equitable redemption options. No Foreign Transaction Fee: This is a key feature for travel rewards cards, enabling consumers to visit other countries without giving a second thought to their credit card or coming home to a bill affixed with a 2% to 4% international usage charge. Even if you don’t plan on leaving the country, this could come in handy if you ever buy something whose purchase price is expressed in a foreign currency or from an internationally based merchant. 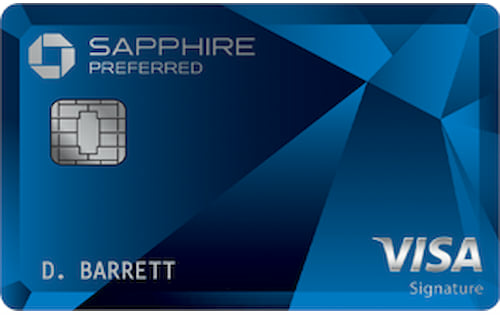 Rewards Redemption Variety: Chase Sapphire Preferred® Card enables you to choose your preferred redemption option without having to worry about your points losing value in the process. In addition to the 1.25 cents per point that you get when redeeming for travel through Chase, Ultimate Rewards points are also worth a bit more than one cent each, on average, when redeemed for merchandise using “Shop Through Chase.” You’ll also get a penny per point when you use your earnings to make Amazon.com purchases, buy gift cards or pay your bill via statement credit.Such consistent redemption value helps Sapphire Preferred make up for the fact that its maximum earning rate – two points per $1 spent – only applies to travel and dining at restaurants. $95 Annual Fee: Many of the best rewards credit cards charge annual fees. The problem is, some of Sapphire Preferred’s chief competitors charge less. Up To 1.25% Rewards On Most Purchases: Even if you manage to redeem your points for travel, giving your earnings a 25% bump in value, you will still end up pulling in only one point per dollar spent on most purchases. Sapphire Preferred’s double-points offer only applies to travel spending and restaurant bills. 11 Rewards Transfer Partners: If you can’t find the travel accommodations that you want through Chase, you can transfer your points to one of its 11 rewards partners at a 1:1 ratio. For instance, one Sapphire Preferred point can be converted to one United Airlines mile. While doing so would mean sacrificing your 25% rewards bonus for travel redeemed directly through Ultimate Rewards, having the option does provide a measure of flexibility – especially if you have rewards in another loyalty account that you’d like to make useful as well. Just make sure you get your money’s worth from whichever travel provider you transfer your points to. For a point of reference, 1,000 Ultimate Rewards points end up being worth around $9 on average when transferred to and redeemed with Chase’s hotel partners. 18.24% - 25.24% (V) APR: This certainly isn’t the highest regular APR among credit cards for people with excellent credit, but it’s still above-average. So, while not paying your bill in full a given month won’t cost you too much, you shouldn’t be lulled into the comfort of consistently carrying a revolving balance. There are better cards for that. Metal Card: This is purely a flourish. Having a metal credit card instead of a standard plastic one provides no real benefit other than it being harder to damage. It certainly doesn’t hurt – Sapphire Preferred is a cool-looking card – but a credit card’s material or design should never be a prominent factor in your credit card choice. The upper echelon of the rewards credit card market is extremely competitive. And while you can’t really go wrong with any of these top-tier offers, it makes sense to understand the differences between them in order to make the best choice for your personal spending habits. In trying to decide whether or not to apply for the Chase Sapphire Reserve card, I have tried to find a human to talk to regarding the rental auto insurance. Specific question is whether or not they cover a car in Ireland or Greece. Can not for the life of me get to a human who can answer. This is a bad omen for the customer service of the card in general. We just switched to the Chase Sapphire Preferred to replace our American Express Platinum card. We were lured by the many benefits and low annual fee ($95/year, first year free). We have had the Sapphire Preferred card only for a couple of weeks, and today (6/29/2018) we received notification that they are gutting Chase Sapphire Preferred card benefits. They cancelled (effective August 26, 2018): Price protection, return protection, lost luggage reimbursement and travel accident insurance. Also, they cut back trip cancellation/interruption insurance to $1500 per person and $6000 per trip. This makes it about the same as other travel cards with $0 annual fee available from Bank of America and others, but Chase Sapphire Preferred charges $95/year after the first year. Extremely disappointing. It only took two weeks of having this card, and after the tedious operation switching many automatic payments online from Amex to Sapphire Preferred, they completely gutted the benefits. Extremely disappointed with Chase as a whole.